There’s definitely an art and a science to injecting insulin. If you take insulin, you may have been taught that there’s a “proper technique” for how to give injections, whether you use a syringe or a pen. In an ideal world, a diabetes educator reviews your technique periodically, especially if you’re noticing unusual blood sugar readings or lumpiness around your injection site, or if you experience pain with injections. 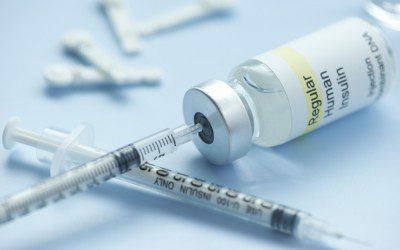 But if that’s not the case, read on to learn some tips to make insulin injections a little easier and help troubleshoot some common injection issues. Today’s newer insulins are generally absorbed the same no matter where you inject them. However, for consistent blood sugar readings, it’s a good idea to stick with the same area of the body for your injections. Make sure, though, that you “rotate” your injections within that particular site on a daily basis. If you continue to inject into the same spot time after time, you can develop skin problems, including lumpiness, scarring, or loss of fat. And avoid injecting into or near moles, scars, or skin that is swollen or inflamed. • Use a new needle for every injection. It’s tempting to reuse needles, but they can become dull even after just one or two injections. And the duller the needle, the more painful the injection. • Use the thinnest needle possible. The higher the gauge, the thinner the needle. • Use a short needle (6 mm or shorter). • Inject insulin at room temperature. • If you use alcohol to clean your injection site, make sure it’s completely dry before injecting. • Relax. Tense muscles make the nerves in the injection area more sensitive. • Larger doses of insulin (30 units or more) may be uncomfortable. If this is a concern, talk with your doctor about splitting your dose. • Rubbing ice on your skin before injecting may also help. • Count slowly to 10 before withdrawing the needle. • After removing the needle, place your finger on the site for 5–10 seconds. • If you use a pen, always remove the needle after you inject. Leaving the needle on can cause air to enter the cartridge and it will take longer to inject the insulin. • Try injecting at a 45-degree angle rather than going straight in. We all forget to do things now and then. Forgetting to take your insulin, however, can greatly impact your blood sugar control. Missing even just one injection per week can raise your HbA1c level by 0.5%. How can you remember? • Link taking your insulin with other daily habits, such as eating breakfast or brushing your teeth before you go to bed. • Keep your insulin and supplies in a convenient place. And think about keeping supplies both at home and at work (or school). • Don’t get distracted. Multitasking is never a good idea, especially when it comes to injections. If you’re doing too many things at once, you can easily forget to inject. Focus on the task at hand. • Set an alarm, use sticky notes, ask your spouse to remind you — all can help you to remember. • Know that the anticipation of the injection is worse than the injection itself. • Make sure you’re using the shortest, thinnest needle that you can. • An insulin pen may be easier for you to use than a syringe. • Put a cold spoon or an ice cube on the injection site for a few minutes before you inject. • Ask your doctor about using a topical anesthetic, which can numb the surface of the skin. • If your needle phobia is severe, talk with your doctor. He or she may be able to refer you to a behavioral therapist who has experience with diabetes and who can work with you to help you feel more comfortable with injections. It’s challenging to travel with diabetes, but the experiences you have make it all worthwhile, says Amy Mercer. Bookmark DiabetesSelfManagement.com and tune in tomorrow to read more.